The woods and copses sprawl into the marshes in this quiet backwater of the county, and there are occasional spectacular country houses, like Raveningham Hall, built in the late 18th Century for the Bacon family. Raveningham, pronounced Ran-ing'm, is one of the little parishes which line the Yare and Waveney rivers in this corner of Norfolk, and which must have been among the very first places that Saxon farmers stopped and said this is the place, here we'll stay. And so they did, creating the Manors which the Normans would divvy up among themselves. Right in the middle of the park, not far from the Hall, sits St Andrew, and to reach it you drive across the wide expanse of parkland, the object of interest for the cows who, on this drowsy day, seemed content just to whisk their tails, shake their heads and snort occasionally. 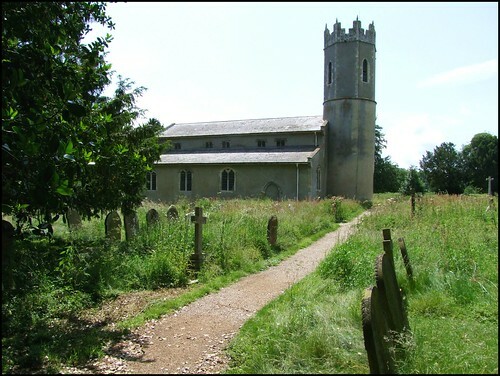 There is a glimpse of the front of the Hall from the fenced path which leads up to a graveyard which is surprisingly packed with 19th and 20th century headstones, considering how small and sparsely populated the parish is today. There must have beern a small Norman church here once, but what you see today is all of the 13th and 14th centuries, including the round tower with its castellated top, I think. The elegant Early English arch of the south doorway is a world away from the rugged Norman survivals you find so often hereabouts, and remarkably the ironwork of the door appears to be contemporary with it. All in all, this building is a testimony to the enthusiasm of the Castell or Castyll family, who owned the manor for almost half a millennium throughout and beyond the late medieval period. There was a considerable 19th Century restoration, which makes itself felt inside and out, and in any case the entire building is rendered in a kind of porridge-coloured cement. It was not unattractive on a sunny day, and the big Perpendicular windows in the nave give it a lighter feel than, say, the austerity of nearby Langley. The first surprise on stepping through the door is the huge block of a memorial to Major Edward Hodge which sits just behind it, fully ten feet tall, with an urn on top like a great handle. It looks for all the world as if it was intended to be used as East Anglia's biggest doorstop. Major Hodge, who died in 1815, was, we are told, a Pious Son, Affectionate Husband, and Tender Father, the only Son of his Mother, and she was a Widow, the pompous valedictory style of the previous century giving way nicely to the impending sentimentality of the new one. The 15th century font is one of the best in this part of Norfolk. The evangelistic symbols alternate with seated figures, who I think must be intended to represent Holy Orders of the Church. One appears to be a Bishop, another a Friar - are the others a Priest and a Monk? As often with the Early English period, you step down into the chancel, where there is an elegant brass to Margaret Castyll, who died in 1483. She clasps her hands in prayer, but what is most interesting is that beside the familiar little dog at her feet is another creature, a dragon. As it is unlikely that Margaret Castyll had a pet dragon, it must relate to the family crest or, as Sam Mortlock suggests, represent St Margaret, her patron Saint. The second great surprise at Raveningham is that the walls of the chancel are completely lined with memorials to the Bacon family, set in an imitation of Early English arcading based on the canopy to what may have been the founder's tomb in the south side of the chancel. It was installed in 1820, hence its pre-Ecclesiological character, which makes it rather delightful. The Kempe glass in the east window depicting the crucificion flanked by St Peter and St Andrew is not, at first sight, the workshop's best. But the little vignettes at the bottom are rather lovely. A serious faced Christ rides into Jerusalem, while in another St Veronica kneels with her handkerchief as Christ carries his cross on his journey to Golgotha.